Obviously, I needed a ROUND TO IT back in September 2009, when I asked readers to modify a tin, following the rules of the Convert-a-Tin Challenge, and share their results. I’m afraid I procrastinated . . . and so did everyone else. Let’s try this again, and make it easy. Modify any kind of tin container you prefer (cookie, candy, coffee, whatever). You can embellish the tin, connect it to something else, make it larger (or smaller), use part of it, substitute it for something else . . . in other words, do whatever you want. Just make sure your end product is different than your beginning product. Then, photograph your results, and come back to this post. Add your link to your photo to the comments in this post by April 30, 2011. Here are the steps I followed to embellish the box. 1. Identify the tin container you will modify. 2. Gather decorating supplies: papers, trims, and ephemera. 3. Rough up the bottom and top of the tin with sandpaper to make it easier for adhesive to stick. 4. Trace the bottom half of the tin 3 times onto card stock, and cut out the pieces. One piece fits inside the lid, the other fits the outside box bottom, and the third fits the inside bottom (although you will have to trim it slightly). Use tape runner adhesive to stick the paper to the inside of the box, and Golden® Gel Medium (you could also use Mod Podge®) to adhere paper to the outside of the box. On the outside, sand off any paper extending beyond the box edges. 5. Measure the interior height of the box bottom, and cut a strip of card stock (you could also use fashion trim) to fit inside the box. Use tape runner adhesive to stick the paper to the inside edge of the tin. 6. Measure the exterior height of the box bottom, as well as the height of the lid, and cut 2 lengths of card stock and/or fashion trim to fit the outside edges. Use your choice of adhesive to stick these items to the edges. Depending on what I’m working with, I like to use a tape runner adhesive, Golden® Gel Medium, or Scotch® Quick-Dry Tacky Adhesive. 7. Trace the box lid onto card stock, and cut it out. Adhere the card stock onto the lid with Golden® Gel Medium (you can also use Mod Podge®). On the outside, sand off any paper that extends beyond the lid. 8. Finally, embellish the inside and outside of the box. How did I make the 3-D flower on the lid? I crafted the blossom using McGill® Paper Blossoms punches, craft molding mat, tweezers and stylus. Then I shaped, pinched, bent, cupped and assembled the pieces. 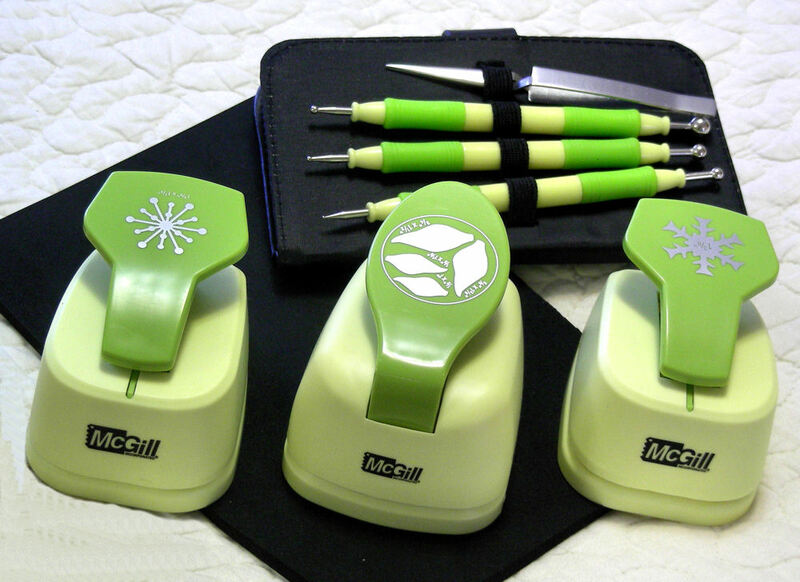 You can visit McGill®’s site here to learn about all of their tools, or click on the photo below. The McGill® Paper Blossoms video below provides step-by-step instructions. Are you participating in the Convert-a-Tin Challenge? Add a link to your photo in the comments below. 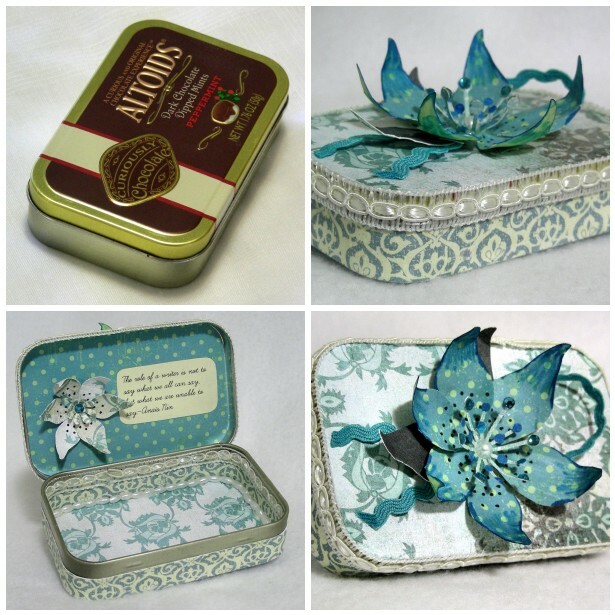 One of my Etsy friends, Ani of CoffeePotPeople, recently challenged herself to modify some tin containers and convert them into works of art. Inspired by a tutorial posted by Kym of kimbuktu (another Etsy friend), she produced some wonderful examples of how art, imagination and upcycling can work together to create something new and attractive. Deadline for completing this challenge: October 31, 2009. Using any kind of tin container you prefer (cookie, candy, coffee, whatever), modify it. You can embellish the tin, connect it to something else, make it larger (or smaller), use part of it, substitute it for something else . . . in other words, do whatever you want. Just make sure that your end product is different than your beginning product! Take “before” and “after” photos, and post them on your blog. Tell us anything you would like about your process. If your inspiration is a tutorial you found in a book, magazine or online, please provide that information. Send me an e-mail by October 31, 2009 at judynolan@aol.com with your blog address so that I can post a list of all participants, and so that we can all see what everyone has achieved. Four simple rules . . . I hope everyone has a lot of fun with this activity. I can’t wait to see the results!